Human rights education (HRE), as defined by the Human Rights Watch Student Task Force (STF), provides knowledge about the historical and contemporary significance of human rights and the mechanisms that protect them, and reinforces skills and values to uphold human rights. 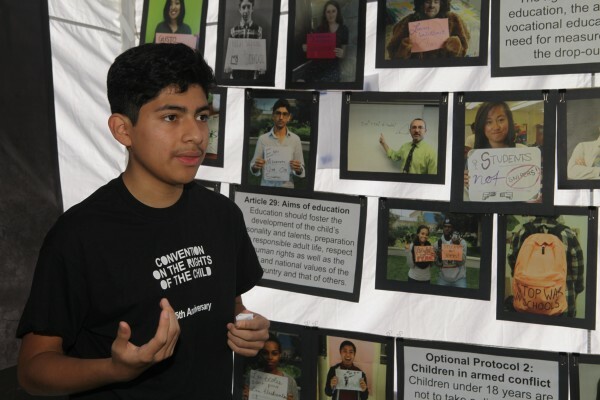 Members of the Human Rights Watch staff and the HRW California Committee South launched the Student Task Force to address the absence of human rights education in state education standards and its rare inclusion in high school curricula throughout the country. STF aims to fill the gap in HRE by bringing together high school students and educators in the Los Angeles area to promote HRE and to empower them to become advocates for human rights, especially the rights of children. Student educates his classmates about the End Military Use of Schools Campaig at a Traveling Children’s Rights Camp. Our students are at the center of our work. With the support of STF staff and participating educators, STF student leaders coordinate weekly chapter meetings and events while guiding their school-based chapters in an annual campaign. STF leaders attend training workshops for human rights education and advocacy ideas to use on campus. At weekly chapter meetings, armed with facts about the issues for the current campaign, student leaders discuss options for raising awareness and develop an action plan of meaningful activities to address the specific human rights abuses targeted by the annual campaign. 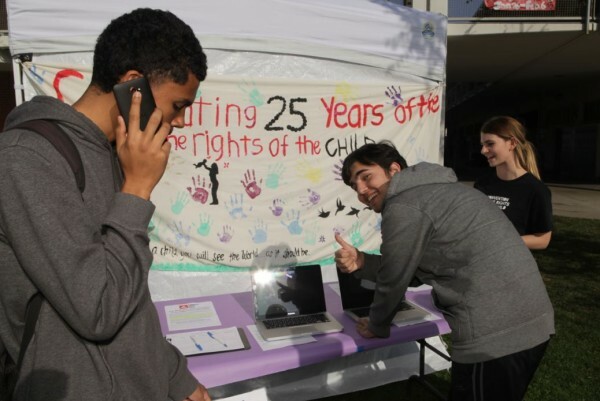 These campaigns, which are designed to coordinate with the work of the HRW Children’s Rights Division when possible, teach students what human rights are, raise awareness about specific human rights issues and engage students to become advocates for these issues. We choose campaigns in which student activism can make a significant contribution and have a lasting impact both locally and internationally. Past campaigns include juvenile justice, ending military use of schools and genocide awareness and prevention. Demian Feldman, New Roads Spanish Teacher, inspires fellow educators to use language from the Universal Declaration of Human Rights. Photo by Patricia Williams. Teacher Advisors and educators are another vital part of STF’s efforts to promote HRE. They participate in weekly chapter meetings and guide students to educational resources to help them effectively campaign for human rights. In addition to providing access to a HRE collaborative community and resources for teachers, such as lesson plans, print resources and multimedia, STF also works directly with our Teacher Advisors to support efforts at integrating HRE into curricula in our member schools. STF has hosted several HRE workshops for teachers and administrators to discuss incorporating human rights into the classroom. STF believes that Human Rights Education should not end when our students graduate or when an internship ends, which led us to the creation of our Alumni Network in 2011. This network utilizes social media to keep alumni informed about STF campaigns and HRW activities, encouraging them to share their reflections, activities and ideas with their peers and current STF members. The goal of the Alumni Network is to inspire our alumni to maintain their commitment to being life-long human rights advocates. 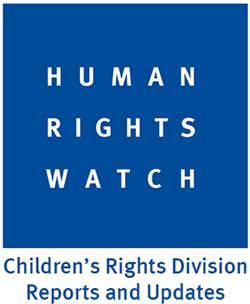 HRW STF intern encourages students to call the White House in support of sending the Convention on the Rights of the Child to the Senate for review. STF’s internship program provides opportunities for university students to learn about and engage in HRE through their work with the program. 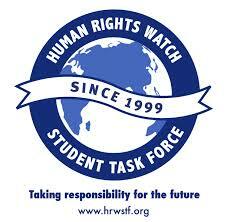 Interns are exposed to human rights issues while helping facilitate the work of the STF chapters. Interns’ responsibilities include supporting chapter leaders and Teacher Advisors to plan weekly meetings, researching and creating advocacy opportunities as well as coordinating campaign events. 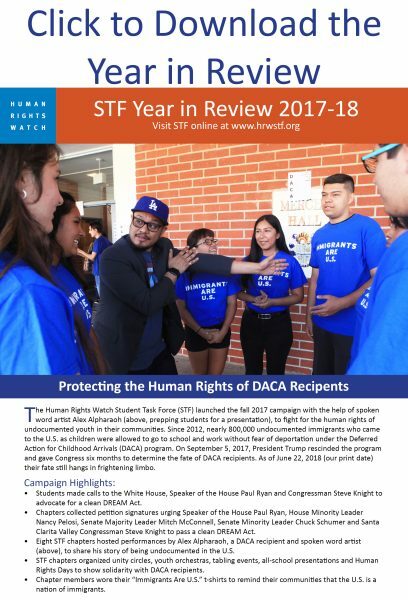 Interns play an indispensable role in the success of STF’s annual campaigns while simultaneously deepening their own understanding of and commitment to human rights advocacy. STF’s internship program also furthers each intern’s personal Human Rights Education by providing unique opportunities such as guest speakers, film screenings, joining in conference calls with HRW, HRE training and specialized courses on human rights issues and advocacy. Internship openings are academic year (August – May) and summer (May – August).